I think he'd be prouder if the 35 was reassembled in running shape. RGlueck wrote: I think he'd be prouder if the 35 was reassembled in running shape. Isn't that the plan? Besides, since it wasn't built until almost a decade after his death, he might not have an emotional attachment to it. He might be more impressed with the DM-30s? I went up to Oyster Bay yesterday as apart of a project from our educational committee. We are creating a short video to use at our visits. We went over to the station building and took some video and still shots. Here is what has been happening since my last update. All of the roof edge moulding has been replaced with all new pre-primed custom milled lumber and on the south (street) side roof line, all of the newly created roof rafter tails that were previously installed have had all new beadboard installed as well. This has finished off the newly restored roof line. The roofers have now begun to install the new underlayment and cedar shingles over the "breatheable" material that is going under the shingles. 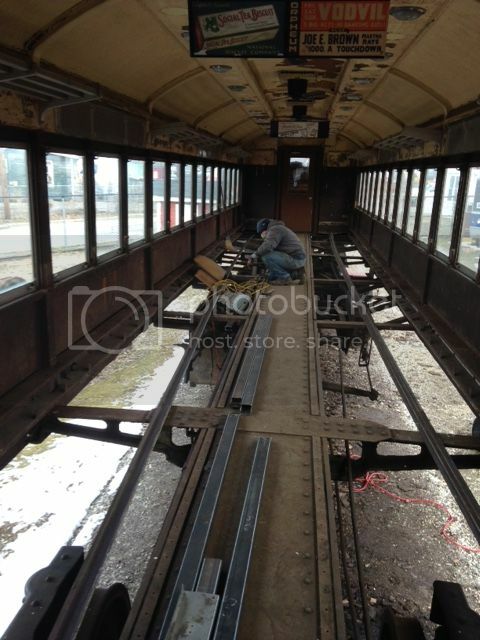 As many of you are aware, for many years the Oyster Bay Railroad Museum (and its predecessors) has diligently worked toward the preservation and restoration of former Long Island Railroad Steam Locomotive #35 as an active display. The Museum's portion of phase 1 of the restoration remains outstanding (just under $10,000) (the Museum having previously expended approx. $23,000 toward the project). This is where we ask for YOUR ASSISTANCE- and for which we respectfully request your prompt financial support in reaching our $10,000 goal. Thank you in advance for your continued and generous support. 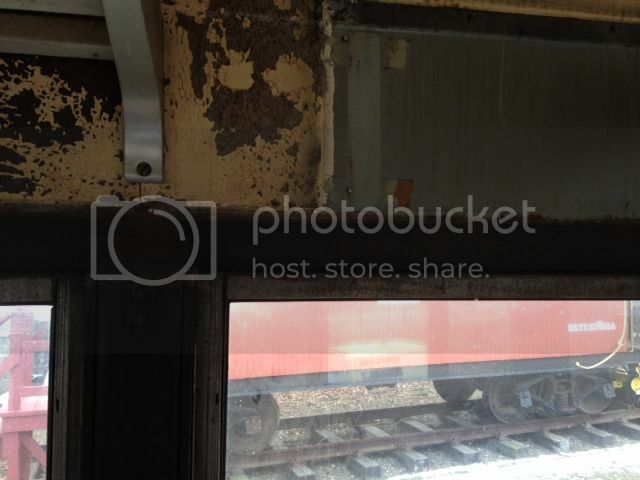 All of the photos can be seen at our website www.obrm.org under station restoration tab near the bottom of the homescreen or at our LIRR 35 Facebook page. As a donation by Steve and Lori Minicozzi of Cozy Enterprises and General Utilities, we now have 2 brand new bathrooms. Steve and his crew installed the substructure for the walls, ran all new electrical and plumbing and will be installing all of the fixtures over the next few weeks to complete them. The brick walls had foam insulation sprayed behind the studs which also gives the wall extra structural rigidity. Also installed were the 4 newly created hopper windows for the North, South and East walls of the addition. Just like the West wall, now the East wall, looks as good as it did prior to the MTA taking over the LIRR. We have been busy these last few months getting the electrical system installed for our turntable. Throughout the last 4 months we have built 3 wooden frames and installed them.Then, we installed the main electrical meter panel and hooked up some piping that goes up towards the LIPA lines that will be tapped for our electricity. We also hung the main cutoff switch/box for the turntable which has a lockout and finally, after many rain/weather delays, installed, leveled and plumbed the circuit breaker box. Our electrician then drilled out the circuit breaker box for the fitting to which he glued up the underground piping. I left early, however, I was told that all of the underground piping is now installed and that we will be able to finally back fill the trench. I hope that we will start running the wiring into the breaker box in a couple of weeks. We would love to be able to operate the turntable during the Oyster Festival in the middle of October! Also, we are getting ready to issue our next contract for the next phase in the ongoing restoration of Theodore Roosevelt's Presidential Railroad Station. This phase will include the removal/restoration and re-installation of the 6 diamond glass windows on the West end wall as well as the removal of the "newer" stucco and re-installation of the curved half-timber accent pieces. Also there will be re-pointing of the brick, paint removal and all new paint to be applied. We will also be under pinning the south-east corner of the building which over 115 years has settled quite a bit. We hope that you will come and visit us this season. 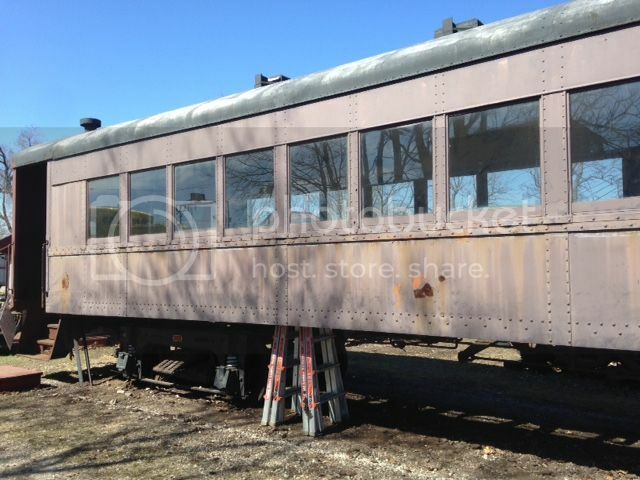 Updates from Oyster Bay RR Museum. 1-The west elevation of the Historic Presidential RR Station is in the midst of being restored and has had 3 windows that have been boarded up since the early 1940's, opened up. 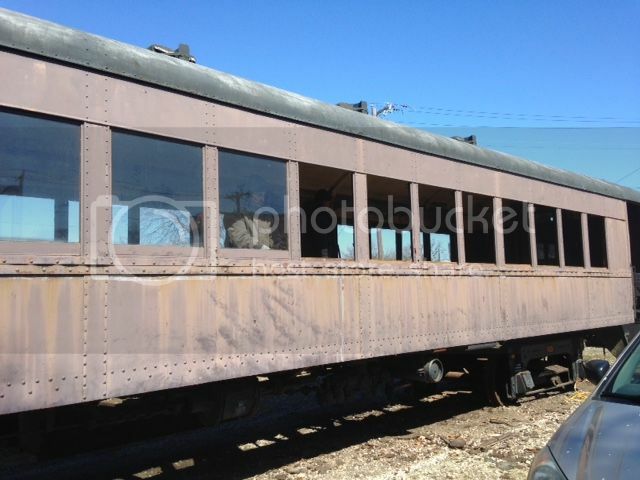 The 3 larger lower windows have not seen the light of day since the passenger sheds were removed and a gable roof was installed over the west end doorway. These 3 along with the 3 original smaller, upper windows have been shipped off to the restoration shop in Rhode Island and are scheduled to return in the early summer. While this is going on, all of the paint has been stripped from the stucco to reveal the original OYSTER SHELLS as well as all of the wood. 2-Also ongoing is the under pinning of the south- east end of the building. For those who do not know, the entire east end of the building was added during the 1901-1902 renovation to add 2 bathrooms and a fireplace. After all, the original building was not of sufficient character for the new President of the United States!! This under pinning involves digging under the original footings about 3-5 feet at a time and placing a new footing to hold everything up. This process should take a couple of months and can only be done when there is a stretch of weather that will allow the placement of concrete without freezing. 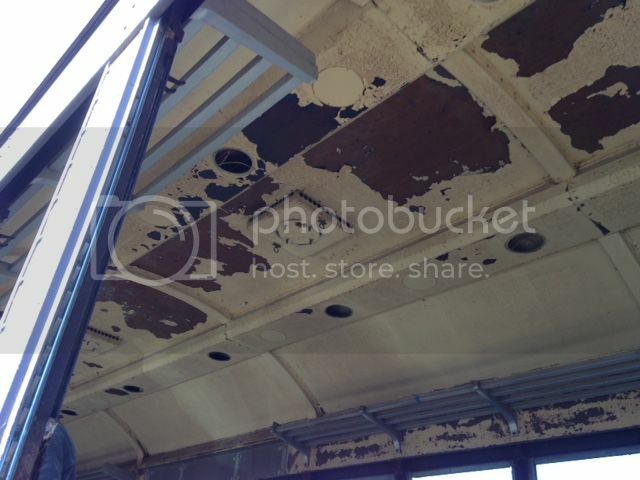 3-Our Former Knox & Kane Ping Pong Coach (yes-Former Steamtown Bicentennial coach and of course, former LIRR Ping Pong Coach) #7433 has had the entire, and I DO MEAN "Entire" floor removed. 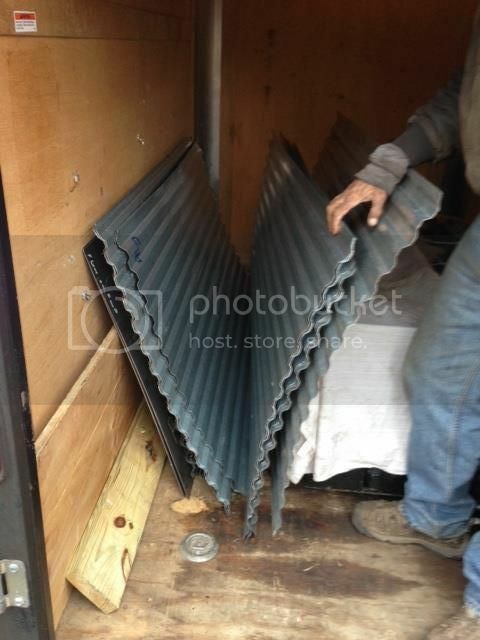 The photo above is of the new corrugated flooring upon which we will re-mount the seating and cover with concrete. This photo shows the North #7 floor bay as we have noted. You can clearly see that we are fitting a new rectangular tubing cross-member which will add much needed structural rigidity and allow us to have an extra welding platform. If you look at inside walls in the corner, you can clearly see all of the paint colors. We have noted that the original color was a dark green over the primer, however we have yet to finalize the interior color that we plan on using. 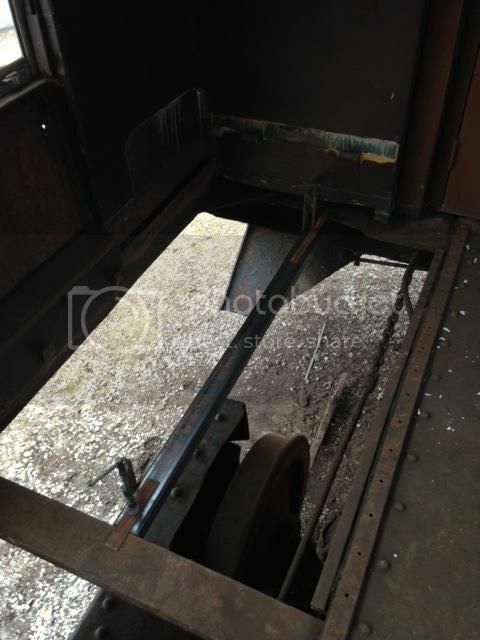 This photo is looking at the East end of the car. This photo shows the North #3 bay which is the longest opening between the original cast cross members and the factory installed "C" channel cross-members. Our cross member is 3 inch by 2 inch by 1/4 inch thick tubing and is now ready to be welded into place. 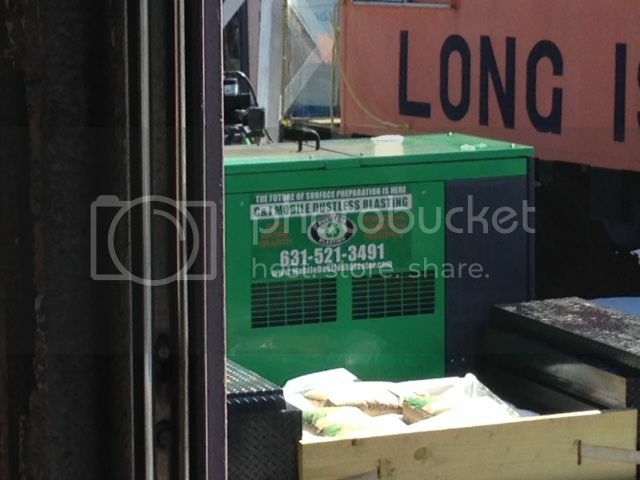 If you look at the steel wall below the window line, you can easily see that there are holes in the exterior sheet metal which allowed the K&K orange paint to bleed through. We have already ordered a few sheets of 4x8 16 gauge steel, new interior wall panels and am waiting on a quote for all new steel fabricated window shade track material as well as 1/8 inch angle iron to hold in place the new interior wall sheets. One of our most dedicated volunteers, George Schlicter, test fitting a short tubular cross-member in the North #1 bay on the west end of the car. 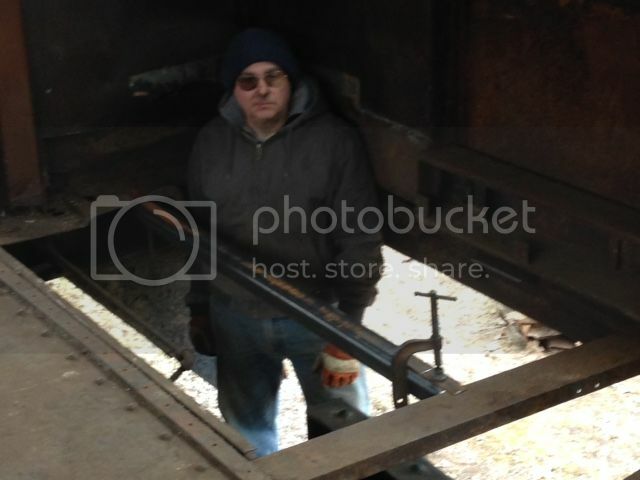 We are most fortunate that we have a former boilermaker/welder-Fred Rubin who has also been braving the cold to fabricate and lead the installation of these parts. This final photo shows a long look from the east end of the car towards the west end showing 2 of the new fitted cross-members in place. 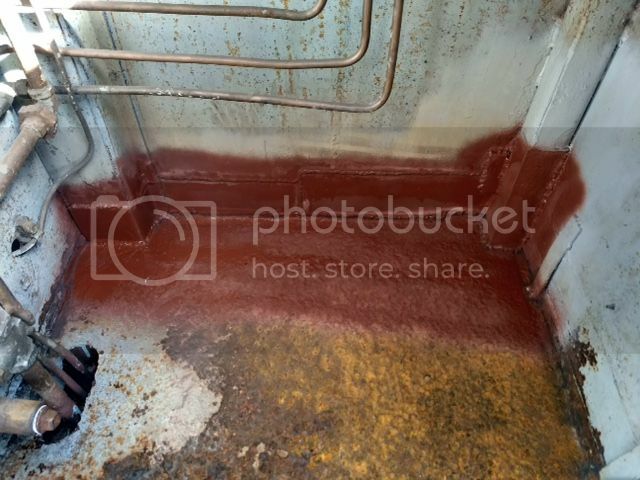 As you look at the right hand walls you can clearly see parts of the rusted out exterior wall and at the back left end of the car, you can see the various colors of the interior paint. Behind this back left wall is the bathroom. 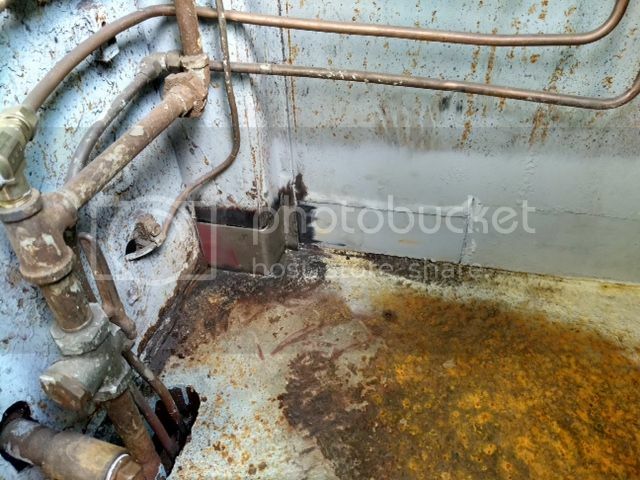 We were able to scavenge an original toilet from one of the Boonton cars in NJ before they were scrapped. Once we finish fabricating the rest of the 14 cross-members (11 left to go, btw) they will be welded into place. 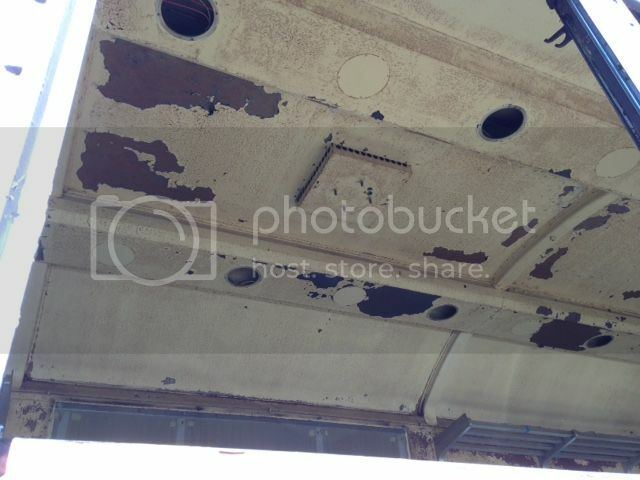 But first, we need to get the entire car sandblasted and remove more rotted metal around the car. So another great day IN Oyster Bay! It's been quite a few years since we have worked throughout the winter and we have been very lucky to have fairly dry weather with almost bearable temps on Saturdays, so Here is where I begin. Last week and today brought very decent weather. Yes, today was a day after the Nor'easter, but the ground wasn't too sloppy and the sun came out with zero rain. A work session to keep the momentum going. As of last week when we showed up, we needed 11 more cross members fabricated and fitted. We ended last weeks session completely finished on the North side. 7 crossmembers, all fabbed and fitted. Today, we started the South side of the Ping Pong Coach. We number the bays from left (west) to right (east) and the bathroom is on the south side. This is bay #1s and because of the distance from the first cast crossmember to the outer frame, we would have cut and fitted a rectangular tube to take up the distance. BUT, because this area runs under the bathroom AND seems to go directly UNDER where the toilet goes (yes, we have an original, American Standard Railroad toilet which we acquired from the LIRR-Boonton cars), we will need to fabricate a more complicated setup both outside the bathroom and inside the bathroom. Think of this as running a double track to double track 90 degree crossover. Like a hashtag #, where the toilet flange will sit at the very center but the north/south legs will have to be "manipulated" to ensure maximum clearance to the door. We will also need to fit up a couple of sections of the corrugated steel to show us where to add a perpendicular angle bracket under the outer bathroom partition wall. A lot of time to fab and fit, so this work will continue well into the end of the year! Meanwhile, the sandblaster will arrive this coming week to do a bunch of test blasts to ensure maximum removal of different materials such as road grime, rubberized coatings, paint, rust,scale, etc. No photos this week, but be sure to follow us on Facebook. Once again, another great day in Oyster Bay. This past Saturday saw our volunteers complete the fabrication and test fitting of the new tubular crossmembers that will be welded under the floor. Once again, on top of these members, we will be installing the new corrugated steel flooring and then a newly poured cement floor. As work progresses, John will also be repairing the engineers wall to the right of what you see and when completed this year, the floor will be stripped, primed and painted in a durable epoxy paint. George began stripping the walls above the window frames in order to remove the window shades and allow us to remove all of the windows and their frames. Our plans are to haul all of the windows over the the Historic Presidential Station in town and set them onto table for stripping and polishing. We will also repair the opening mechanisms. Outside the station we will have our volunteers washing and scrubbing all of the dirt and ????? off of the shades. Surprisingly, they are in decent shape. This is where the shades live above the windows and are covered by an almost 60 foot steel extrusion that is riveted over the dark area which is a well. 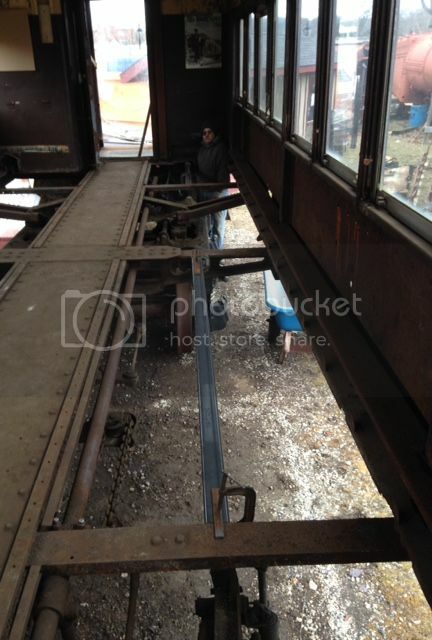 This photo shows you the 2 steel extrusions which are sitting on top of the cast cross members. on top of the center sill are the newly fabricated tubular steel cross members which will be welded into place in their respective bays after sandblasting of the interior. On top of this is where the new corrugated steel flooring will be attached and upon which will have concrete poured. Nice series of progress photos! I know concrete floors have often been the standard for passenger cars, but is there some question about the retention of water against the steel? P54 melt when there is moisture next to the steel. I am not doubting your skill or methods. This is purely an inquiry. RGlueck wrote: Nice series of progress photos! I know concrete floors have often been the standard for passenger cars, but is there some question about the retention of water against the steel? P54 melt when there is moisture next to the steel. I am not doubting your skill or methods. This is purely an inquiry. Our plans are to get the corrugated welded in and then to install the steel plates which the seat frames are bolted upon. After all of them are in, we will level the car and then the corrugated will be sprayed with a rubberized undercoating under the car and where the corrugated meets the walls. Then we will place a thin plastic sheet around the perimeter upon which we will then pour and screed the concrete. When dry, we will then glue down a new 9x9 tile floor in a checkerboard pattern. It’s a very detailed description to just say that we can only take as many precautions as possible but there isn’t anything else we can use except the most up to date materials which should be as good a barrier as we can use on top of the steel. I hope that explanation helps! Sounds well thought out. Thanks for the speedy response. This is one rare car, and I hope she remains in good condition for centuries to come! an even greater day in Oyster Bay!! Lets start off with the fact that after clearing out all of the scrap steel from the Ping Pong Coach and bringing it to the dealer, we came out with a significant amount of money back. Shows you, don't throw anything away.RECYCLE! While that was being loaded, Fred and I began to fabricate and test fit the final 2 cross members to go under the bathroom section. Now all we need to do it fit the toilet flange to 2 pieces of angle and weld them to these 2 cross members. We have a tentative date for our sandblaster to perform test blasts on the car. We also have a tentative date for our rigger to come in and move various pieces around the yard in order to free up the spots for the 2 new simulators on the west edge of the yard across from the turntable. Our rigger has them safe and sound in one of his warehouses. And! while all of this was going on, George, Bernard, "Hicksville" Danny and "Lynbrook" Danny, 2 new volunteers who saw our volunteer work session notice on Facebook, were inside of the Ping Pong Coach removing every fixture from the ceiling. The light covers and actual light assemblies, ceiling fans and sign boards. 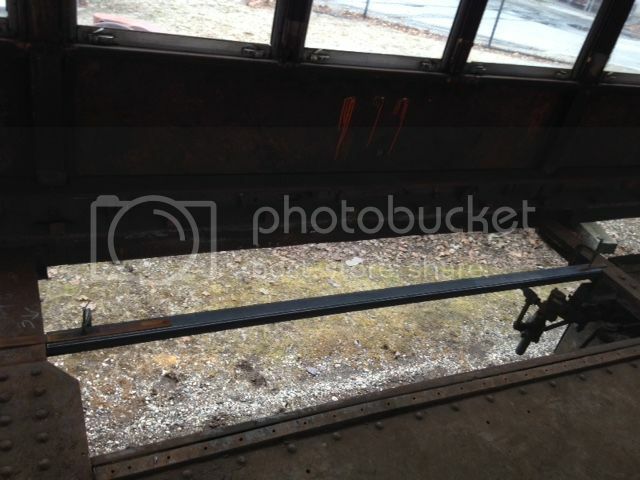 We have chosen to leave the aluminum luggage racks in place until the last minute in case we need hand holds but these too will be removed and eventually replaced by original wrought iron units which were donated by LIST NRHS many years ago. All we need to do this is to get an original bracket so we can copy it. If anyone reading this post happens to have one of these units in their "collection"or knows someone who does, we would appreciate the opportunity to borrow a bracket for us to photograph, measure and use as a template before we return it to you. And to finish up the day, we also took out every window on the south side of the car. We have been having many debates as to what color to paint this but any way we go, we will need to rebuild, re-seal and re-weather strip every window in the car, so they function. Yes, we also plan on washing every one too. A view of the window removal from the inside-notice that there is no floor to stand on except the center sill and cross members! We are planning on an April 21st opening day at the yard and invite you all down to view our progress in person. Who knows? By then we may part of the floor down! As long as the rain stays away, we are ok in Oyster Bay! 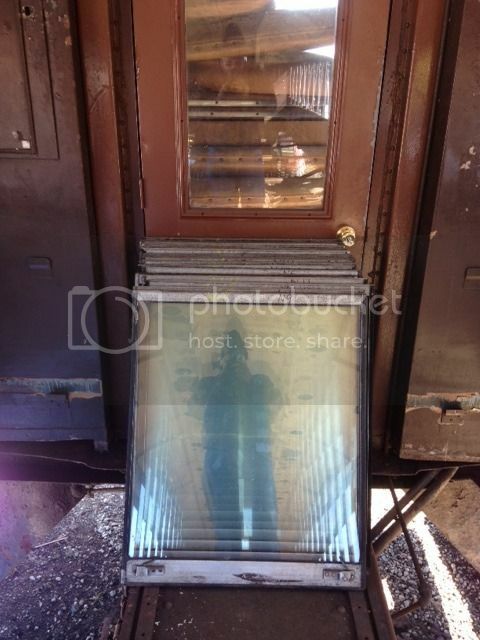 This past Saturday saw our volunteers remove the balance of the Ping Pong Coach windows (17) and then move them into the Historic Presidential RR Station bathroom which is not currently being worked on. We also removed, degreased and primed all of the newly fabricated cross members and when dry, placed them in storage. Surprisingly, our Sandblasting contractor called to say that a job he had that day fizzled out and could he come over to do his test patches. after setting up and suiting up, he measured out a few 1 foot by 1 foot squares on the body, roof and interior in order to time the removal and test different pressures. Every test blast he did averaged out to 27 seconds and left all of the test patches clean and ready to accept primer. He said that our roof even cleaned up in the same time and was NOT covered in the rubberized paint that we all assumed was there. We are just waiting on his quote for just the interior and for the entire car. After we get it and can approve the job, he can have the car done in a week. He uses a new system called "Dustless Blasting" as the media is contained in water and trust me, I've researched this for quite some time in the automobile industry and yes!, it does work. Because I used my Iphone video to time him, I cannot upload the video, but it is amazing. 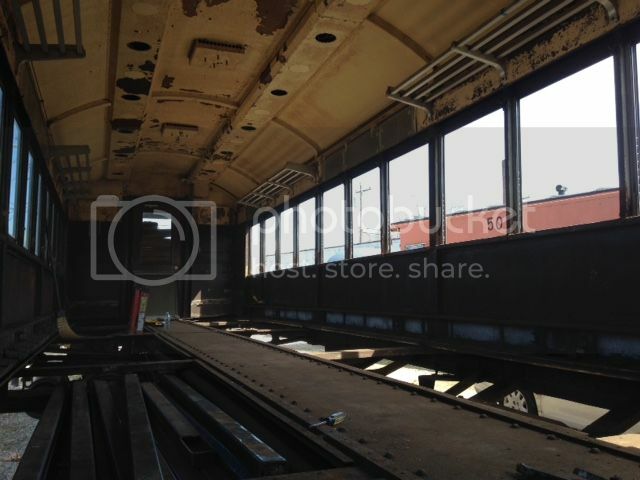 As of 3 pm when we left, the entire interior of the car is empty and ready for blasting. All we need to do now is remove all of the seats from the vestibules and put them into storage inside the trailers on site. Today We had our rigger in for a site visit and after this coming Saturday, we will have the site ready to move a bunch of pieces in order to ready the yard for the arrival of our 2 newly acquired simulators. Our last steel delivery should be on site by Saturday afternoon. We now can proceed with creating a template for the restoration of the tender for #35-we need to replace a specially curved section on the engineers side that has to be cold rolled and fabricated. It should be a fun day of fabrication. Stay Tuned-we re-open the Museum on Saturday April 21st! What simulators did you receive?